I’m not sure what I’m more excited about here: the bulgogi or the grill I used to cook it. 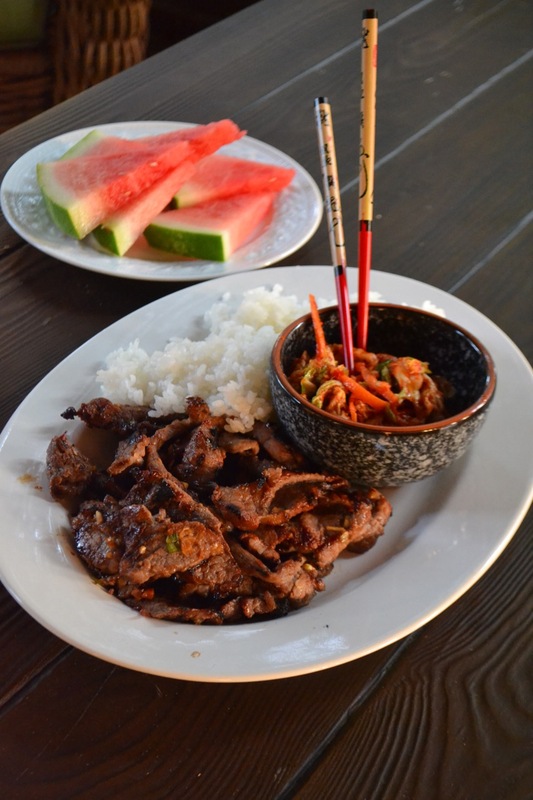 Korean bulgogi, “fire meat,” is a recipe that every grilling enthusiast should have in their back pocket. You marinate thinly sliced strips of beef in a flavorful marinade and then cook them in seconds over a rocking-hot grill. Paired with chilled kimchi and steamed rice, it’s a knock-out main course that leaves everyone fighting for seconds. You should also be fighting over the grill. Portable, yet still powerful when it comes to grilling, I’m thinking about keeping it permanently in my car. Like a spare tire and a flashlight, a grill at the ready seems like preparedness at its best to me. But I digress. The grill, the HEXX, is a lighter, smaller version of the original Quad Cooker. The carbon steel grill top reaches temperatures in excess of 900 degrees Fahrenheit (just like the original grill) meaning ridiculous grill marks and lots of flavor fast. My uncle invented both the Quad Cooker and the HEXX. And while that’s why they both ended up at my house, it’s not why I’m writing about them here. We love to grill and while we resort to gas grilling for its convenience, we always lament the lack of flavor from not using charcoal. 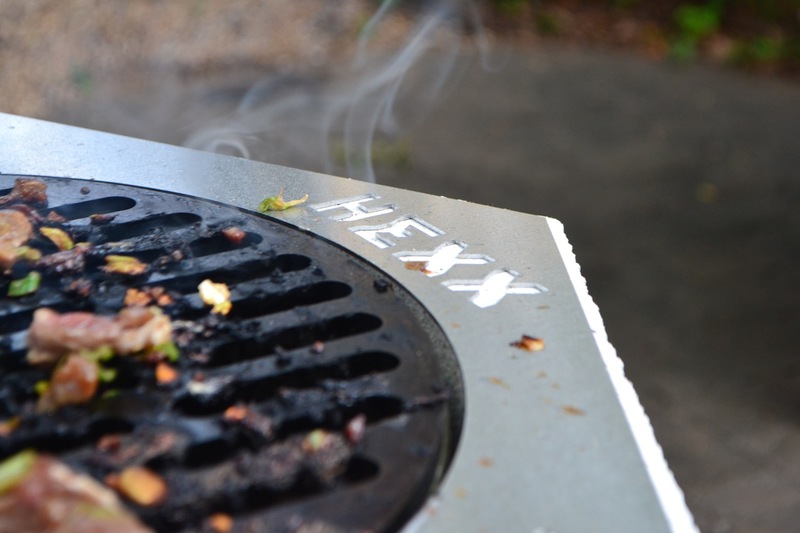 What I like about the HEXX is that its small size makes set-up and break down easy enough that it is worth the hassle of dealing with charcoal for just a two person meal. The fact that it does all that while still delivering great cooking results made me want to tell you about it here. If your a fan of the flame, I encourage you to learn more about the HEXX at the official website. But back to the bulgogi. When I teach this recipe in cooking classes, someone always asks if I made a mistake with the marinade. There’s just not that much of it. Don’t worry. Press on. The marinade, made with such aromatic ingredients as soy sauce, ginger, sesame oil, and green onions packs a lot of punch and the thinly sliced meat means that a little marinade goes a long way. There is also sugar in the marinade which means that unless you want to be like “#@#$ $@$@% %@$@%!! !” when you are grilling you need to cook this on a clean,well-seasoned grill or wipe the grill top down with oil before adding the meat. You’ve been warned. It brings me great pleasure that you can now find pre-made kimchi in the produce section of most well-stocked grocery stores. I think it’s a condiment that everyone should get behind. While the pre-made stuff is great, I still prefer to make my own. The best recipe that I’ve found is David Chang’s recipe for kimchi from his cookbook Momofuku. Also featured on the Today show (recipe here), Chang’s recipe requires a trip to your local Asian grocer, but having a jar of homemade kimchi in your refrigerator is well-worth the effort. Happy grilling! 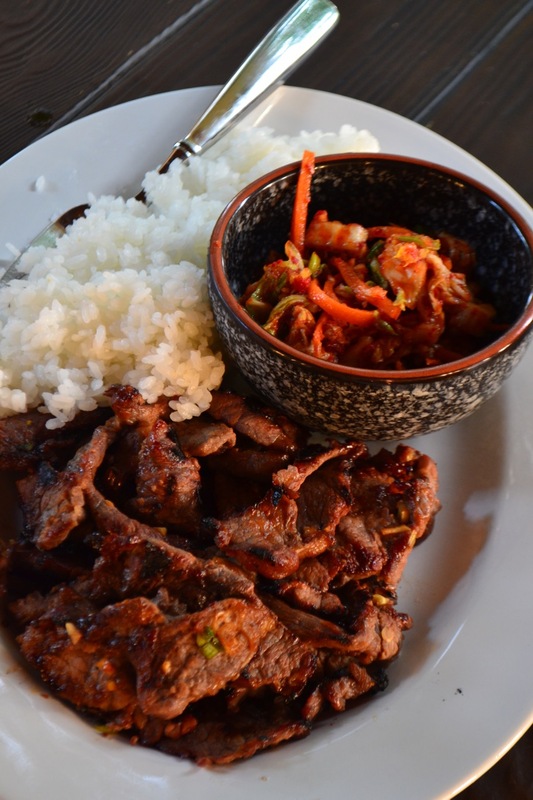 Bulgogi, also known as “fire meat,” is Korean BBQ. The meat is marinated briefly before being seared over high heat. Serve with steamed short grain rice and kimchi. Thinly slice the flank steak and place the strips in a bowl. In a small bowl, whisk together the soy sauce and sugar until the sugar dissolves. Whisk in the sesame oil, garlic, and green onions. Pour the marinade over the strips of flank steak and toss to coat. Cover the bowl with plastic wrap and marinate the beef in the refrigerator for at least thirty minutes. Heat a grill over high heat. Remove the beef from the refrigerator and drain the marinade. Brush the grill with vegetable oil and sear the beef strips about 30 seconds on each side. Do not cook too long as the meat will get tough. Sprinkle the grilled meat with the toasted sesame seeds and serve with steamed short grain rice and kimchi.